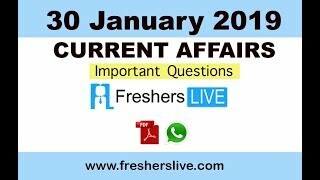 Current Affairs 30th January 2019: Instantly obtain Latest Current Affairs 30th January 2019 with all essential info, Be the first to know all the Current affairs 30th January 2019 top news, Major Issues, Current happenings, Important events in National as well as International level with clear explanation. For all competitive exams and Interviews, equip yourself with the Latest Current Affairs 30th January 2019 granted here. Prime Minister Narendra Modi will visit Surat and Dandi in Gujarat . During the daylong visit, Prime Minister Modi will lay the Foundation Stone for the extension of Terminal building at Surat Airport and attend the New India Youth Conclave. He will also inaugurate a hospital in Surat. The Surat Airport Terminal building will be constructed at a cost of Rs.354 Crore in 25,500 square meters area. It will be an eco-friendly sustainable building, using solar energy and LED lighting. Uttarakhand’s first tulip garden will come up over 50 hectares of forest land in Pithoragarh district at a cost of Rs 50 crore. The state government has obtained the Centre’s nod for development of the garden. To be developed by the ONGC, under its corporate social responsibility programme, the proposed tulip garden will be the country’s second after the one located in Srinagar (J&K).